If you were to look up the term "glutton for punishment" in your favorite dictionary, you would most certainly find a picture of yours truly. Ya, I seem to have a way of taking a simple task and turning it into the fiasco of the century. To what am I referring? You guessed it! My durn wall photo collage thingy! 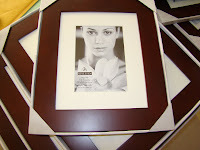 Almost $200 later, we were returning home with a new collection of wall frames, ranging from 11x14 to 5x7. PERFECT! 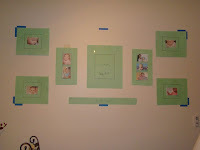 So of course now I needed to make new wall templates to match the specs of my new frames. That took all evening. 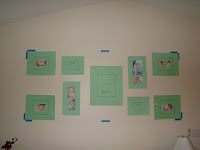 Once I had them finished, I put them up on the wall to start debating the layout. 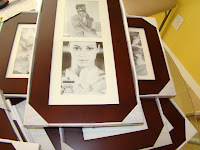 Now I need to order additional prints of the pictures I want to use in the sizes that I need them in. I love using Shutterfly for this, but I've also found it's quite convenient to order prints directly from iPhoto (I Love My MacBook!!!). While iPhoto prints tend to be less expensive than Shutterfly, my experience has been that Shutterfly prints and ships a few days quicker than iPhoto. Plus I want to use a matte finish and iPhoto only allows glossy. So I'm going to order my prints today and start finalizing my wall template to the point where I can mark drill holes, etc. Should be fun! I am so impressed and yet a little freaked out at how much attention you are giving this! I can't wait to see the final product! I wouldn't plan at all, I'd just start hammering away and hope some kind of organized randomness is the result.